The A-400 features a dual core 800Mhz CPU. 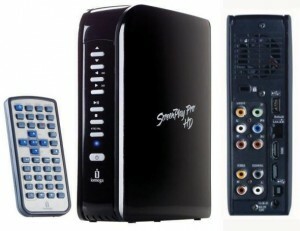 too expensive, compared to the existing flaws: firmware updates may freeze the player; video library cover-art match is not always accurate; setup with Synology DiskStation DS213+ initially failed, no support of AAC protected audiofile, weak AirPlay support, limited customisation of menu’s; local drive wake-up is slow. Posted by bioss at 9:11 pm on April 25th, 2013. Categories: support. Tags: gear, video. The latest firmware version installed on this device is Version 1.04.03. 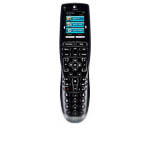 Lightweight device with excellent compact remote keyboard. Easy menu. Lacks some codecs support for mkv files. Switch the sound system settings to ‘Stereo’ instead of ‘Digital’ if you do not get sound during movie playback. Posted by bioss at 3:04 pm on March 3rd, 2012. 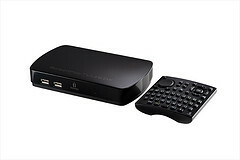 The So Speaky + HDMI is a multimedia hard disk player incorporating a 4 in 1 Card. Easy menu but only supports FAT32. FAT32 does not support files larger than 4Gb. Formatting this drive with NTFS support will not work. You will be left just with an external drive but without access from the multimedia interface. It will not find any of the files on the drive. If you did persist in the idea and formatted to NTFS, then you will need an extra tool to format back to FAT32. One of the tools that worked is SwissKnife, a freeware programme that only works on Windows XP (it did not work on Windows 7). Posted by bioss at 4:39 pm on September 10th, 2011. The latest firmware version installed on this device is Version 1.4.0.92. Lightweight and compact but heats up very quickly. Easy menu. Posted by bioss at 11:19 pm on May 1st, 2011. The ScreenPlay Pro supports the following video codecs: MPEG-1, MPEG-2 (HL/ML), .MPEG-4 (part 2), ASP, DivX (3.11, 4.x, 5.x, 6.x, HD), Xvid, MP4. AVI, MOV, MKV, VOB, and ISO are container formats. Specifically, AVI, MOV and MKV contain file playback information as well as the formats used for audio and video streams. The video commands (play, rewind, forward, slow, etc) work well. Network file system performance is weak. Because the H.264 codec is not natively supported. It is required to use the included transcoding server software to stream the video into a format that the ScreenPlay Pro HD can natively play back. It is however, recommended, in this situation, to re-encode the video stream of the file into a format that is natively supported by the ScreenPlay Pro HD. This will make sure that the file can be played directly from the device without needing to be connected to a netwok. If you have a file that contains S-VOP’s (GMC), then you would need to re-encode that file. Re-encoding a file can be done with freeware, such as PocketDivXEncoder. Windows 7 has new security policies put in place that forbid incoming connections that do not utilize a new CIFS/SMB (Samba) standard that has been implemented in Windows 7. Because of this, the problem can be fixed by changing the policies regarding CIFS/SMB connections. I am required to say that you can perform these policy updates at your own risk. This may or may not make your system less secure to other devices on your network, but we will not be held liable for anything that may occur when these default policies have been changed. There is a guide out there that can be found by doing a Google Search with the term “Windows 7 network file sharing policy fix”. It will guide you, step by step, through adjusting your policy to allow your ScreenPlay Pro HD to connect to Windows 7 public shares. Posted by bioss at 1:56 pm on January 4th, 2010. Categories: support. Tags: audio, storage, video. This step takes the most resources (CPU, disk space, etc.) and time to process (count at least one hour for a DivX movie). Run this task during your computer idle time (i.e. when you don’t use it for other tasks). Although iTunes has some embedded conversion capabilities, I do not recommend it to use to convert your files to MPEG-4 format. Videora iPod Converter is freeware and works fine for most of my files. If the images are ‘stretched’ (i.e. taler than wide), then you will need to tweak the profile by manually adjusting the video setting: enter the image resolution values (height x width) from the file properties (‘Eigenschappen’ – see picture). I recommend to instal the (default) English version because the Dutch one has some flaws. iStudio (Easy Computing) is a basic commercial software and easy to use. The 5G iPod’s resolution is fixed to 320×240. In iStudio, you may select ‘480 x 360’ resolution and ‘Best’ quality for for a crisper image. Both tools create an MPEG-4 file in an iPod compatible format. This step allows you to add additional information to the MPEG tags. Check also my other iTunes settings. or by dragging the file from the its folder to the Video library. iTunes will copy the file and add it to the library. Now you can add additional information to better manage the file in iTunes and on your iPod. The ‘Album’ name and the ‘Genre’ allows you to retrieve the video files on your iPod (when navigating through iTunes). Enter the same ‘Album’ name for your movies and tagging the ‘Deel van verzameling‘ (Part of compilation) keeps the files in the same folder of your iTunes directory on your hard drive. The ‘Soort video’ (Video type) determines in which video list this file will show on your iPod. Tag the ‘Afspeelpositie onthouden’ (Play position) if you like to resume the playback on your iPod. This is the step to copy your file from the iTunes library to your iPod. Make sure your iPod is docked and shows in the iTunes ‘Bron’ (Source) bar on the left. Open the Video’s library in iTunes and drag the video file(s) to your iPod. The file(s) will be copied and will show in the video list on your iPod. Check also the Videora ‘Video File to Device Conversion‘ guide. Posted by bioss at 2:30 pm on August 14th, 2009. Categories: support. Tags: ipod, itunes, video. Handleiding om video files geconverteerd met iStudio (versie 1.0.6.316), Videora en iTunes af te spelen op een 5G iPod. In deze stappen wordt een DivX bestand ‘Hi-Fidelity.avi’ geconverteerd naar een MPEG-4 bestand ‘Hi-Fidelity.mp4’. De iTunes instructies refereren naar versie 6.0.4.2. Deze stap neemt veel tijd en energie (CPU, schijfruimte, etc.) in beslag om te verwerken (reken tenminste een uur voor een DivX film). Voer dit proces uit op je computer terwijl er geen andere taken worden verwerkt en geen andere programma’s aktief zijn (vb s’nachts). iTunes beschikt over een ingebouwde conversie-functie voor MPEG-4 formaat die ik echter niet aanraad. Videora iPod Converter is freeware en werkt goed voor de meeste bestanden. Krijg je ‘uitgerokken’ beelden op het iPod bestand, wijzig dan het ‘profile’ in Videora: voer de Afbeelding resolutie (Breedte x Hoogte) in van de bestandseigenschappen (zie afbeelding). Installeer de (standaard) Engelse versie van de software. In de Nederlandstalige versie zitten nog een aantal fouten. iStudio (Easy Computing) is een commerciëel programma dat eenvoudig is in gebruik. De 5G iPod resolutie is steeds 320×240. In iStudio, kies Schermresolutie ‘480 x 360’ en Kwaliteit ‘Beste’ voor een goed resultaat. iStudio heeft een ingebouwde (DivX) player. Beide programma’s maken een MPEG-4 bestand aan in an iPod compatibel formaat. Deze stap laat je toe om informatie toe te voegen aan de MPEG tags. Hou ook rekening met mijn andere iTunes settings. of door het bestand vanuit zijn folder naar het ‘Video’s’ venster in iTunes te slepen. iTunes zal nu het bestand kopiëren en toevoegen aan de bibliotheek. Nu kan je bijkomende informatie ingeven om het bestand beter in te delen in iTunes en op de iPod. Met de ‘Album’ naam en het ‘Genre’ kan je de video-bestanden makkelijk (gesorteerd) terugvinden op de iPod (tijdens het bladeren met iTunes). Aktiveer ‘Deel van verzameling‘ en kies dezelfde ‘Album’ naam om de video-bestanden in eenzelfde folder te behouden onder de iTunes directory van jouw harde schijf. Kies ‘Bestand van nummer tonen’ in het ‘Bestand’ menu (Ctrl-R) om te kijken waar het bestand zich bevindt op de harde schijf. De ‘Afspeelpositie onthouden’ aanvinken om te vermijden dat het afspelen telkens herstart vanaf het begin. Met deze stap voeg je het bestand toe aan de inhoud op de iPod. Deze stap is overbodig indien iTunes is ingesteld voor Automatisch bijwerken. Zorg ervoor dat de iPod is aangekoppeld en verschijnt in de iTunes ‘Bron’ (aan de linkerzijde). Open de ‘Video’s‘ bibliotheek in iTunes en sleep het video-bestand naar de iPod. iTunes zal nu het bestand kopiëren en toevoegen aan de video afspeellijst op de iPod. Posted by bioss at 2:09 pm on August 14th, 2009. Posted by bioss at 10:01 pm on June 19th, 2009. Categories: support. Tags: audio, video, windows, XP.